The most adventurous of our “Best Vacations Ever” starts off with two (well really three but we’ll get to that) amazing and amazingly different undiscovered natural destinations then finish off with relaxation and comfort at Costa Rica’s most upscale and popular wildlife viewing spot. There are actually two San Gerardos about two hours apart. They share a lot of similarities and fit into this itinerary equally well so I thought I’d include both and let you decide. San Gerardo de Dota is near the high point of the Pan American highway down a steep hill southwest of Cerro de la Muerte and best known for the cloud forest, waterfalls, and paramo (tropical tundra) found there. There are a few nice rustic lodges at San Gerardo de Dota. We prefer Trogon Lodge over the others for it’s cottages set in beautiful gardens in the midst of the roble (oak) forest along the Savegre river. They also have a small canopy zip line course that’s perfect if you want to try it but don’t really want to Go Big. If budget is no issue then there’s no doubt that Dantica Lodge is in a class by itself. We’ve splurged a few times and never regretted it. The views are intense through the huge plate glass windows fronting the rooms which are built on a hillside so steep you don’t need curtains for privacy because no one could ever get in position to see in. They also have the best system of private trails in the valley. There’s an excellent trail that starts where the road into the valley dead ends and it follows the river past two falls, cave falls and Savegre falls. Near the trail head is one of the best spots in Costa Rica to see the resplendent quetzal – a bird watchers grail with a three foot iridescent green tail. All of the lodges also offer tours with certified birding guides if you don’t have any luck on your own. San Gerardo de Rivas is on the other side of the Pan American highway an hour further along up a steep hill northeast of San Isidro and is also best known for the cloud forest, waterfalls, and paramo (tropical tundra) found there. 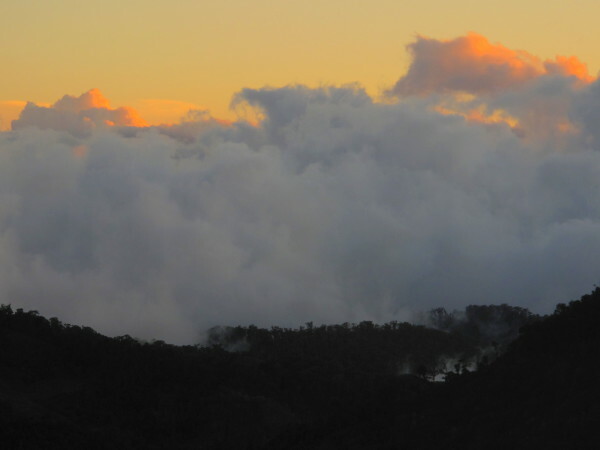 It’s also the gateway to Cerro Chirripó National Park and trail head to climb the highest peak in Costa Rica. 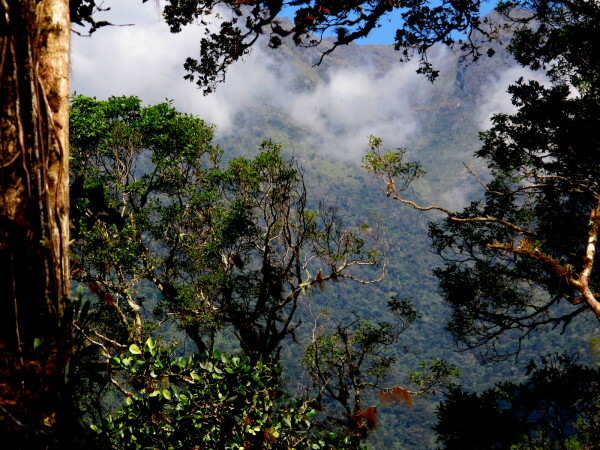 There are dozens of miles of trails in the park and two adjacent reserves, Talamanca and Cloudbridge, and they pass through roble (oak) forests, cloud forest and finally up to the paramo passing beautiful waterfalls very reminiscent of San Gerardo de Dota. There are a few hotels and hostels but we’ve been coming here for over two decades and can say without hesitation if you’re on a budget (and maybe even if you aren’t) stay at the eclectic little Casa Mariposa. Rustic with a couple of tiny under eves private rooms and a couple of bunk rooms – all shared baths. If you’re traveling in the mid/superior range then Talamanca Reserve is the clear choice. The “river” rooms are quite basic (but private baths) but the superior rooms up the hill are quite nice, modern, brightly lit with big windows looking out at a moss garden and tiny waterfall. The reserve has about 40 km of well maintained trails and entrance is included if you stay. We climbed the peak in 1993 and I’m glad I did it when I was young(er?). It’s a two day trek. Climbers stay in a refugio in the Valle de Conejos near the top before attempting the peak early in the morning hoping to see both oceans simultaneously before the clouds roll in. Hacienda Barú & the Valley of the Waterfalls – The lodge at Hacienda Barú is just a short walk down a trail through their private wildlife refuge from a 5 km long nearly deserted beach but we usually only make it to the ocean for a quick swim and to watch the sunset after a long day of adventure inland. 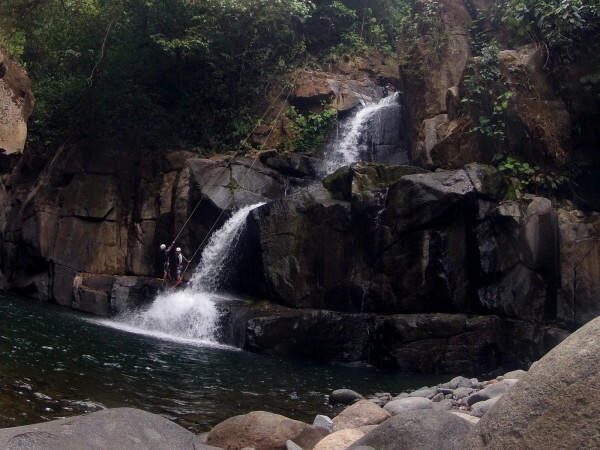 The area above Dominical known as the Valley of the Waterfalls has three of the most amazing freshwater experiences in Costa Rica. 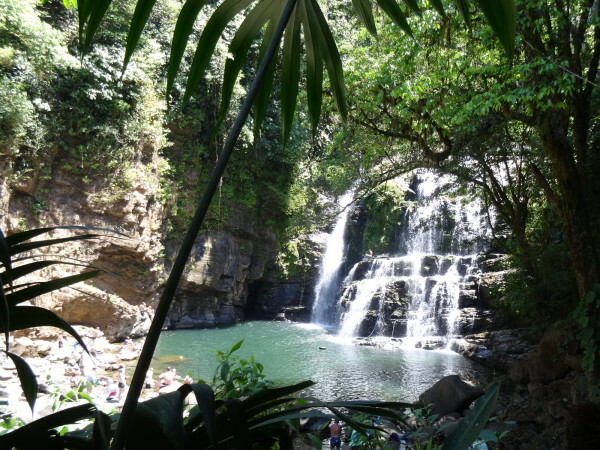 Nauyaca waterfalls is that waterfall you see in videos where a diver makes a perfect arc in front of a massive tropical cascade then swims leisurely across a huge pool under the rainforest canopy to climb out on a sunny rock. We love taking people here. It just blows them away. Horseback rides are available or you can drive to the trail head, buy an entrance ticket and hike the 4 km in. 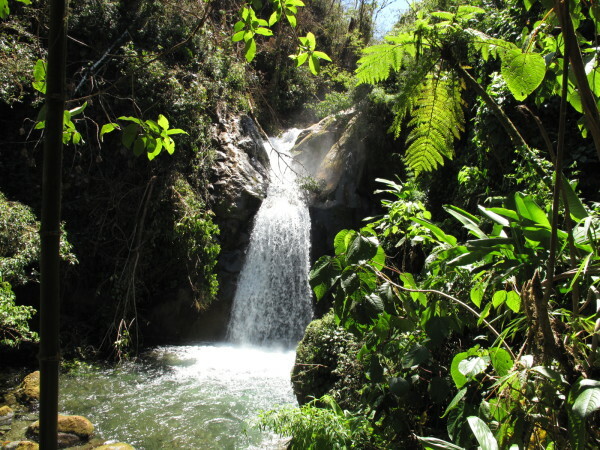 Diamante waterfall is one of the highest in Costa Rica and if you hike to the top of it then keep going up there’s a special experience in store. We’ve done a lot of things in Costa Rica so for me to say this is one of my favorite is a big deal. The Tree of Life tour has a small camp complete with sleeping platforms, picnic tables, a propane fired kitchen and eco-toilet and shower facilities set up under a massive overhang behind a waterfall. The overnight waterfall “cave” tour is amazing. The final waterfall adventure is also guided by the folks who bring you the tree of life. It is a series of waterfall rappels, jumps, pool swims and river scrambles on the Diamante river downstream from the big falls. This is not a “big metal platform” commercial canyoning tour, it’s the real thing, but if you’re in reasonable physical condition (you can walk five miles easily) there’s no experience necessary and the exceptional guides will instruct and ensure your safety the whole way. You may find you want to stay here for six or seven days because after you do all the waterfalls you still have trails to hike, birds to watch, kayaks to paddle through the mangroves and oh yeah that beach…surfing is excellent at Dominical 2 km south of Barú. We always stay at Hacienda Barú. They have four 2 bedroom cabins and 8 modern rooms alongside the swimming pool. It’s nice but not at all fancy. It’s a true eco-lodge and there is no A/C or TV. There are a number of upscale rental homes in the area and Hotel Cuna de Angel is beautifully done (we toured but didn’t stay) but when you find paradise why would you go anywhere else? 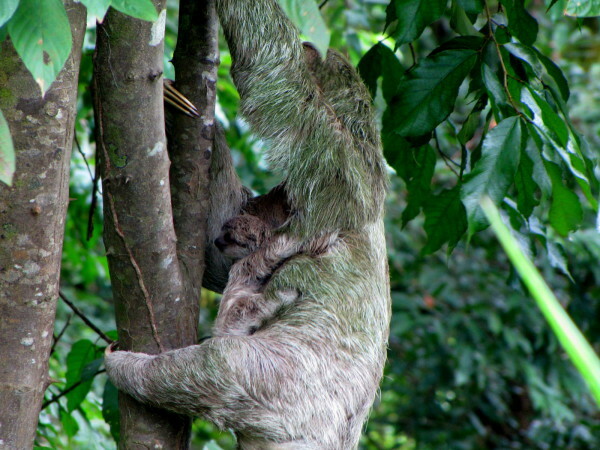 Manuel Antonio is the relaxing reward for surviving all the hikes treks and caves of the first few days. You’ll be glad you spent all that time in the waterfalls by Barú because the playas in Manuel Antonio National Park are worth waiting for. The mountains drop straight into the Pacific here and dramatic rocky headlands protect coves with perfect crescent white sand beaches. 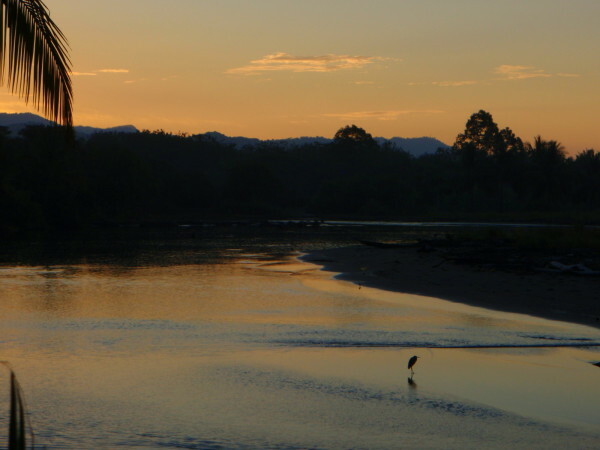 This is also most popular wildlife watching destination in Costa Rica and you can explore on foot with a naturalist guide or climb in a sea kayak (super stable and easy to do I was pleasantly surprised) and paddle the coastline stopping at sheltered reefs to snorkel. 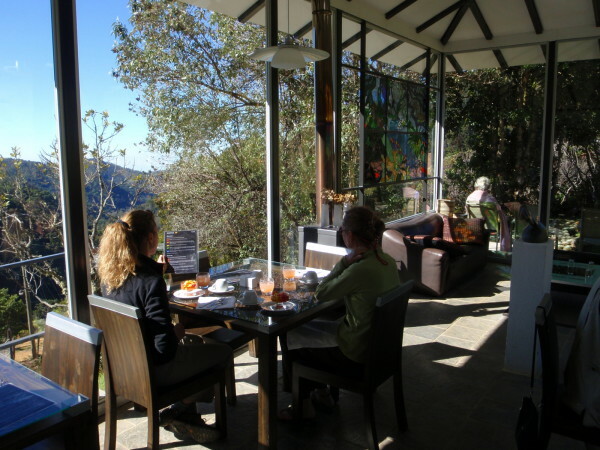 Mostly though by the time we get down from the mountains and waterfalls we just want to relax with a nice ice cold imperial at a cliff top ocean view boutique hotel and watch the sunset. Buena Vista Villas are a perennial favorite as are Si Como No and Costa Verde. Arenas del Mar is the best luxury hotel in Manuel Antonio (I know Conde Naste says Gaia Reserve but trust me the Arenas private beach puts it way out ahead). There are some amazing over the top rental properties if you’ve got ten grand a night in your budget and some reasonable ones too. When we aren’t splurging and treating ourselves, Hotel Playa Espadilla is our favorite mid-priced hotel with a great location near the park entrance and a short walk to the beach. 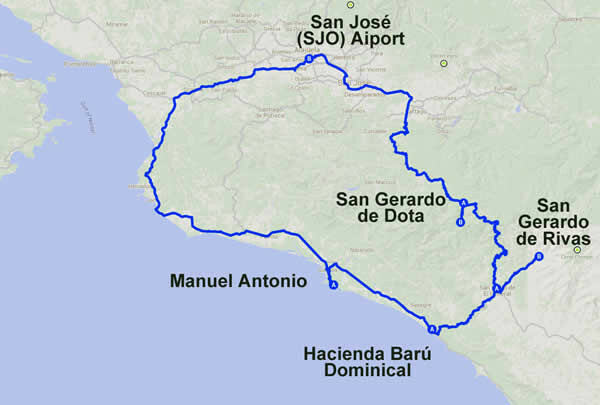 CostaRicaGuide.com also publishes free printable maps of all of Costa Rica, and the hotels, resorts, restaurants and activities around Manuel Antonio that you can download to use when you don’t have GPS or cell signals, and print out if you like to have something in your pocket (choose your maps here). Fly in and out of SJO international airport in San José. It’s the starting and ending point of this itinerary and typically $100 cheaper than Liberia Airport. This itinerary can be done easily with either a rental car or using shuttle vans. Tourist vans are a bit expensive but enough people do it that it’s not ridiculous. Things are a bit spread out in all these areas but mostly you’ll eat at your lodge or on the tours so a car isn’t a necessity. Backpacker’s Travel Note – this itinerary can be done by public bus if you want to go to San Gerardo de Rivas and Chirripó but will require an extra overnight in San Isidro. You’ll have a hard time with San Gerardo de Dota. There is no bus service and no official taxi service. It’s a long cold walk down to San Gerardo from the highway where the buses pass at Ojo de Agua. Remember you have to choose either San Gerardo de Rivas or San Gerardo de Dota – if you want to do both you better add a few days. The destinations are a little farther apart and you’re really going to want to do the overnight behind the waterfall so this itinerary is hard to do in less than 7 nights. As always we recommend talking to your boss, offering to work on New Years Eve next year in exchange for a couple more days in Costa Rica. You won’t regret it. This itinerary can be cut down to 6 or 7 days and still be reasonably relaxed if you drop Manuel Antonio off the end and just head straight back to the airport from Barú/Dominical. Does “Peaks & Waterfalls” Sound Like Fun?